Right now in the United States, we find ourselves at an energy crossroads. Do we double-down on fossil fuel infrastructure, as our current President suggests? Or do we begin the hard work of transistioning into a serious, clean energy economy? The main argument against investing deeply in renewables like solar energy has often been made on price point... but things are changing. ​In this article, we explore the shifting landscape of energy costs and outline some shocking new developments in the battle between big coal and solar energy. ​As recently as 2014, writers across the internet were proclaiming the eternal supremacy of coal, oil and natural gas. Forbes staff writer Christopher Helman, for example, made the bold proclamation that solar would never replace coal, in spite of our (still ongoing) solar boom. Helman’s points are solid – but never is a word that the future seldom respects. Certainly, his dire prediction did not stop Brittain from celebrating its first ever, coal free electricity day, just this past April (2017). And the significance of a day without coal in Brittan cannot be overstated. Only 10 years ago, powering Brittain in the absence of this fossil fuel (for 24 full hours!) would have been completely unthinkable. In Germany, 2017 saw the installed capacity of solar electricity eclipse the installed electrical capacity of natural gas. Another unthinkable outcome. Coal still edges solar out when measured in these terms, but only by a single digit number (about 7 GW). And it is not just Germany. Consider the (quite unexpectedly) exponential rise of solar energy world-wide. Global installed solar capacity has smashed even the most liberal of estimates made 20 years ago. Consider: back in the year 2000, the grand total for all solar power installed on the planet was predicted to be around 10 GW. Here in 2017, we&apos;ve rocketed past that rate by over 2,200% with 227 GW, installed... and the rate is continuing to accelerate. The exponential adoption of solar energy is less surprising when we pull apart the investments being made around the world in this booming technology. Countries like Chile, the United Arab Emirates, Saudi Arabia, Jordan, and Mexico have all invested heavily in the structural framework necessary to support wide-spread solar adoption. These preparations have driven solar costs down on some big ticket installations to less than 3 cents per kilowatt-hour! Coal power on the other hand? ...The global average cost of coal limps in at nearly double that number. Here in the United States, solar subsidies have been in place since the 1970s, corresponding to a massive investment in solar over time (in the form of lost taxes). This has forced utilities to adapt to solar power installation on a larger and larger scale (and encouraged their own investments, as well). ​US, Utility-scale solar power is now available at just around 6 cents per kilowatt-hour ("Levelized Cost of Energy" - see our article on solar costs for details), according to numbers from the US Department of Energy. This number sharply rivals the cost of coal-fired electricity. The result? Solar has reached an incredible point here in the US: grid parity. Grid parity occurs when the levelized cost of solar power matches the cost of electricity from the electrical grid (once the stuff of science fiction fantasies). "The grid" is an interconnected network of substations, power plants and wiring; it supplies homes, business... just about everything, with electricity. When an energy source is said to reach grid parity, it means that the cost of using that energy source matches the cost of buying electricity straight from the grid. That makes it as financially viable as other types of energy, like coal or hydroelectric, for example. One 2016 study, conducted by the renewables analyst Green Tech Media, found that solar power in 20 US states had already achieved this stunning landmark. Additionally, they predicted that 42 states in total are expected to reach grid parity by the year 2020. At the time of the study, Oregon was less than 10% away from reaching this important milestone. But the global leader in annual solar power investment is China by far. In 2015 alone, China invested $102 billion into domestic renewable energy, doubling that of the United States and exceeding UK’s expenditures by five times as much. With investment at these levels, the meteoric rise of solar energy&apos;s adoption becomes significantly more understandable. How in the World Are Solar Prices Doing This? What you are seeing here is a illustration of what is known as "Swanson&apos;s Law" (a relative to "Moore&apos;s Law"). "Swanson&apos;s Law" is named after Richard Swanson, the founder SunPower, a solar manufacturer. It is a set of consistent observations around the price of solar panels. Essentially, when the global manufacturing capacity for solar panels doubles, the average price of producing those panels drops by about 20%. Just about every time. 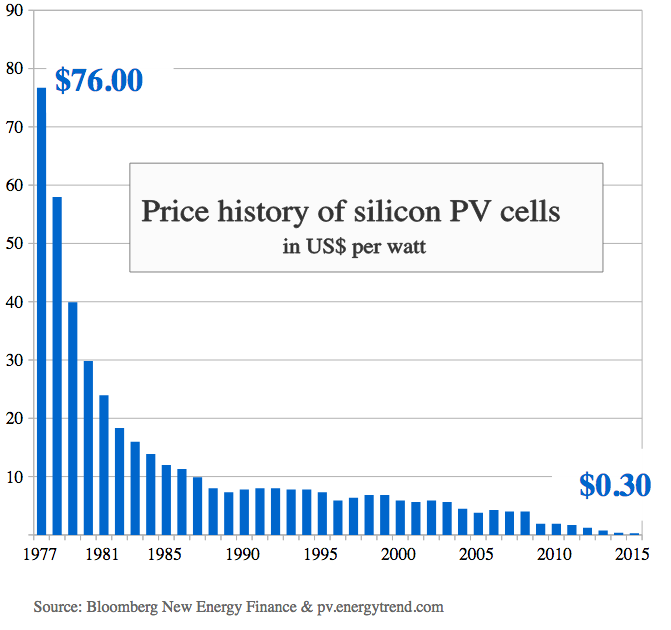 This leads to periods of exponential change where the cost of solar plummets. For example, between 1990 and 1995, the number of facilities producing solar panels was somewhat constant, as the global demand for solar stabilized at the conclusion of the 1980s. Brief periods of increased demand allowed the development of additional manufacturing centers, however. This allowed prices to edge downward on the whole through the early 2000s. You may notice from the graph, though, that sometimes prices increase. This is because the cost of solar rebounds upward slightly when the demand for panels rises ...until additional manufacturing centers are built. Recently, we&apos;ve seen a massive increase in global manufacturing capacity. This has created an astonishing period of solar price reduction and prompted states like Oregon to drop solar energy incentives... and it is great news for 2018! There is a limit, of course, to the number of times that the total manufacturing capacity of the planet can double. In the same way, there is a limit to just how cheap solar panels can get. However, we have not reached that limit yet. Big Coal: On the Way Out? With the viability of solar skyrocketing, is there a corresponding decrease to the monolithic power of coal around the world as well? The answer is a resounding "yes." Global coal production numbers are dropping at a breakneck pace all over the world, as reported by BP In 2016. Coal demand in the U.S. dropped by mammoth 33.4 million tons. China, at the top of the list when it comes to aggregate energy consumption, used up its lowest amount of coal in six years. And the shift is not confined to just these countries either. The BP report showed that coal consumption dropped on every single continent other than Africa. In 2016 alone, the overall global demand for coal fell by 1.7%. This change is made even more significant by the fact that consumption actually rose by 1.9% year over year from 2005 to 2015. The reality is that the cost of building new solar facilities are already on par with new coal power plants in the United States and Germany. Grid parity is becoming a reality and solar costs in the giant economies of China and India are expected to catch up to coal in just four years. All this according to the Bloomberg New Energy Finance (BNEF) 2017 report. Beyond that, the U.S Energy Information Administration estimates that coal prices will continue to rise while costs of solar drop (presumably in accordance with Swanson&apos;s Law). ​Additionally, progressive carbon tax initiatives around the world are increasingly popular, and penalize coal extravagantly in comparison to lower-emission solar technology (the Union of Concerned Scientists estimates life-cycle global warming emissions for solar panels at 0.07-0.18 lbs. of CO2/kWh (including manufacture, transportation, etc). On the other hand, coal emits a whopping 1.4-3.6 lbs. of CO2/kWh - an average 2000% higher emission rate per kWh of electricity). These outcomes prompted Bloomberg New Energy Finance chairman, Michael Liebreich, to note in 2016 that “...renewables are robustly entering the era of undercutting” [fossil fuel prices]. This is a bold assertion. Does the data support it? According to BNEF’s 2016 Climatescope report, the world as a whole is now adding more capacity for clean energy each year than for coal and natural gas combined. Solar naysayers might point to wind as the cheaper technology in this equation. However, shocking data from the report indicate solar prices in 58 emerging-market economies (including the "big 3;" China, India and Brazil) are now lower than new wind prices as well. This is quite a change in the predicted financial landscape of only a decade ago (and certainly worthy of Liebreich&apos;s passion on the topic). It is the clearest indicator available to demonstrate that the future is dropping coal... in favor of cheaper, longer-lasting, renewable and reliable solar energy. The picture painted here is rosy indeed for solar energy. But there are limits ...for now. Solar energy is an intermittent energy source. This means that its power waxes and wanes in accordance with the level of sun energy that strikes the panels of an installation. When clouds roll in, power levels decrease; and the sun does not shine at night, of course. ​An international team of scientists tasked with predicting the trajectory of the world&apos;s markets toward Terrawatt scale solar energy installations, cited and identified other challenges as well. Chiefly, the authors note that when intermittent power sources exceed approximately 30-40% of the grid&apos;s energy input, the grid can become extremely difficult to stabilize. Coal, natural gas and hydroelectric on the other hand operate as baseline power. They are consistent and their contributions can be increased or decreased as needed. Feasible solutions exist, including the widespread deployment of battery technology, but we are a number of years early for this to be of significant help in the short-term. Additionally, the authors note that better grid management strategies can go a long way toward stabilization, but there are significant limits. Rooftop Solar to the Rescue? Perhaps not entirely, but one of the most compelling aspects of solar power is how it can be used on the individual level. Traditional power generators are usually located in one centralized facility. An Oregon town’s total power needs, for example, might come from a single coal plant a few miles down the road. With solar power (specifically rooftop photovoltaic solar systems), each home can collect and generate power to handle its own electrical needs. This allows homeowners to save on energy costs and reduce dependency on outside electricity providers. This relates to grid stability challenges directly. How? Grid-connected homes can contribute significantly to the national electrical grid at large. This decentralized energy network (also known as distributed generation) helps boost grid reliability, improve power quality, and eliminate some costs according to the U.S. Department of Energy. These effects could provide a solid help to maintaining power stability for installations on the whole, perhaps. Regardless, a diversity of power generators (and increasingly common residential battery systems) are clearly and important part of our energy future here in Oregon and across the world. For a more in-depth look at how Oregon is embracing solar power as a viable energy source, check out Solar: A Rising Star in Oregon’s Energy Portfolio. Even if solar power can&apos;t completely eliminate coal through its plummeting price point alone, the future is clear. The global shift towards solar is a clear representation of how far this exciting and eco-friendly renewable has come. Given time (perhaps far less than any of us predict) and innovation in grid stability and energy storage techniques, coal may indeed become a "past technology." Possibly as soon as 2030 by some estimates. The future belongs to solar energy, and days of coal&apos;s dominance around the world are clearly numbered! Keep Learning: Solar Incentives Are Disappearing. ...And It Is Great News! Here&apos;s Why.